I impressed myself with this soupI admit it, it was a surprise. I love when I can surprise myself, its such a treat! Its a pretty rare occasion because you obviously cant hide what youre thinking from yourselfor can you? Hopefully Ill find out the ways of the mind in my Psychiatry rotation next month! Woohoo. Back to how impressive this soup is. I bought a bunch of ingredients that I thought would go well into a thai-inspired soup. I decided to be adventurous and go sans-recipe into this spicy world, thats right This is a Jennie Original. I figured if it didnt taste good I could add so much spice that all Ill taste is the flesh of my tongue. Tasty! Lucky for me, this soup turned out to be so full of flavor (and heat of course) that I ate the entire pot of soup in less than 24 hours. I admit, I had nothing else in my fridge to eat (student life) but regardless, this soup was one of my favorite things Ive ever made. It was full of veggies, tofu, rice noodles and the broth was spicy with a touch of sweetness. Amazing. Taking photos of this soup got a little wacky though. 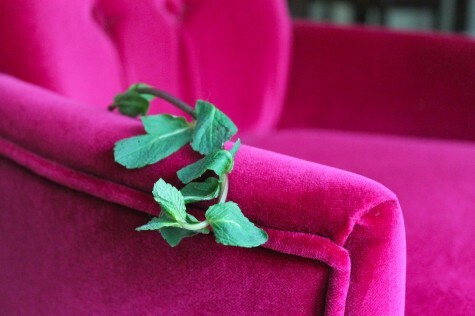 My mint kept posing on my furniture and begged me to snap photos of it. How weird is that? Does your mint do that too? 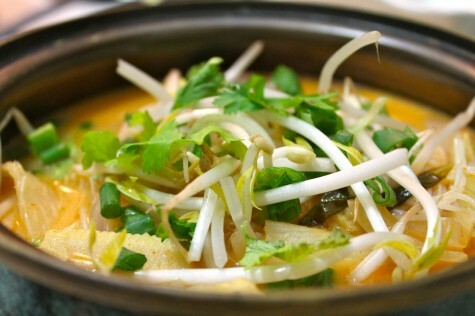 In a large pot, mix together stock, coconut milk, garlic-chili sauce, basil, lime juice, fish sauce, sugar, lemongrass, and ginger. Bring to boil on high heat. Reduce heat to low; simmer 15 minutes. Stir in red curry chili paste. Add tofu, mushrooms, corn, onion, bamboo shoots and chiles. Simmer another 15 minutes. Stir in tomato and cooked rice noodles. 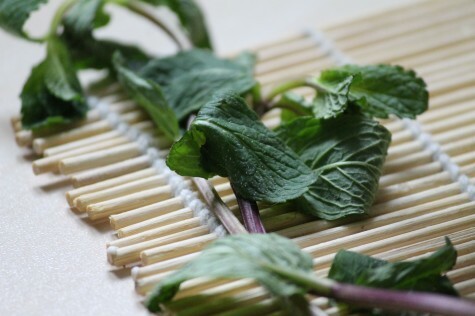 Before serving, remove lemongrass and ginger or you can eat around it. Ladle soup into bowls and garnish with a handful of bean sprouts, green onion, mint and cilantro. 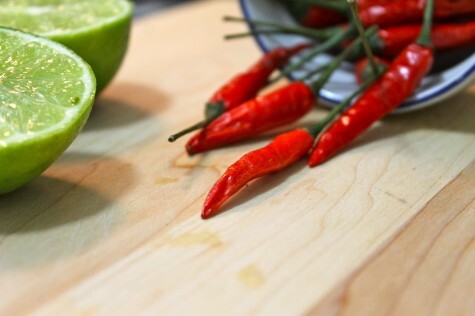 Serve with a slice of lime. 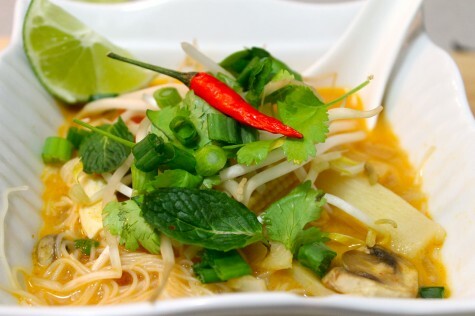 Thai food is one of my favorite foods to eat (and cook!). 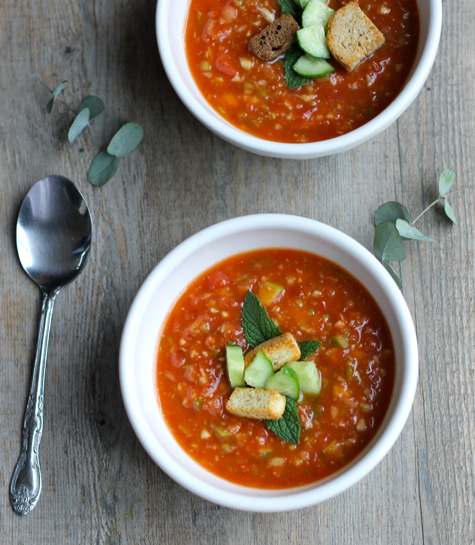 I hope you try out this soup, it really is great! Dont be scared to substitute or leave out ingredients use what you have on hand! Whatever ingredients you have left over you can use in this Thai Mango Salad! I dont really like green soups. I know its a strange statement to make is it the color greenor is it the specific vegetables used? It may be my aversion to all things related to mucous ( yes, Im in medical school and I totally queeze at the site of mucous)if you see me, please cough the other way So I guess Im going to go with a thick soup consistency with a green color! 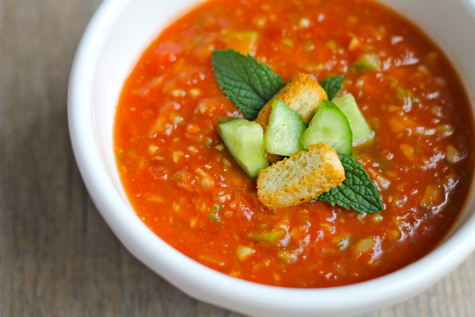 Since I dont like green soups, that knocks out a number of popular soups to make in my kitchen. Orange soups thats where the money is! Give me an orange soup and Ill devour it in seconds. 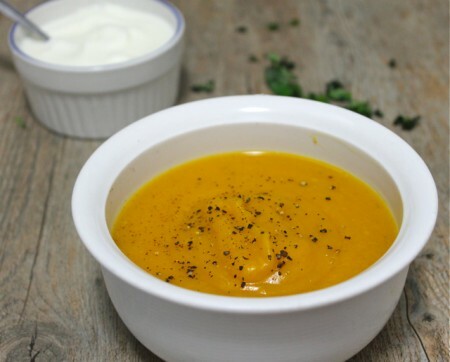 Ive previously made a Carrot ginger soup that was great, and now Ive made an identical looking but completely different tasting curried butternut squash and sweet potato soup. The soup (as with most soup recipes I like) is fairly easy to put together and incredibly tasty. The spices add a hint of heat while the squash adds some sweetness. Once pureed you get a thick, smooth soup that is satisfying. I added in a dollop of yogurt when I served it. My friend (and neighbor) wasnt too keen on the yogurt idea but once she tasted it she was hooked it complements the heat of the soup well. Peel, seed and chop all vegetables. In a large nonstick saucepan, heat oil. Sauté garlic, onion and mushrooms until softened about 5 minutes. Add squash, sweet potato, vegetable stock, ginger, curry, cumin and paprika powders. Reduce heat, cover and simmer for 30 minutes. Purée in food processor or with hand blender until creamy and smooth. Stir in honey and milk, blending well. Add salt and pepper to taste. 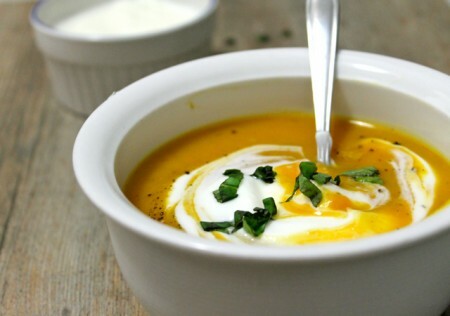 Ladle into bowls and top with a dollop of plain yogurt, chopped fresh basil and freshly cracked black pepper. 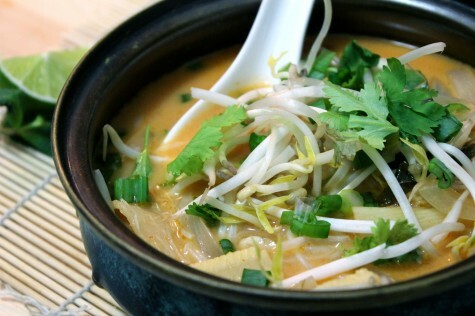 Hope you try this soup out its a healthy and satisfying soup for a cold night!